Labour's deputy leader wants to use controversial new legislation to help women get top jobs in the City. 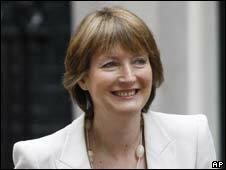 Harriet Harman told a campaign group, the Fawcett Society, that the forthcoming Equalities Bill would be "a catalyst for change". She said employers should be able to positively discriminate in favour of women, disabled people and ethnic minorities in certain circumstances. Ms Harman also said the bill would put an end to the gender pay gap. Business groups have called for a moratorium on new employment law, arguing that it could delay economic recovery. Ms Harman has said she wants to combat the male-dominated culture of the City, and banks in particular. Speaking ahead of the Equalities Bill returning to Parliament, she told the Fawcett Society she hoped it would "shake the kaleidoscope". If passed, it would allow employers to take what she called "positive action" and appoint people from underrepresented groups provided the candidates are equal. Ms Harman is also seeking support for a proposal to force companies with more than 250 staff to publish average hourly rates for men and women. This would, she hopes, put an end to pay discrimination against women. At present, 40 years after the introduction of the Equal Pay Act, women in the UK still earn on average 23% less per hour than men. That disparity rises to more than 40% in the City - worse than in any other sector. "This is about employers coming clean with their employees," Ms Harman has said.